Think Smart, Play Smart, Be Smart. 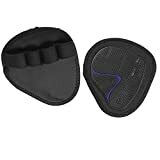 Features: Be Smart Antimicrobial Neoprene Weight Lifting Grips Pair Gel ‘IMT’ Direct Mould provides utmost ‘No Slip’ Grip. Made from Thick Neoprene With Rubber Palm Material to provides comfort and protection against calluses and blisters. 4 finger Loop Super Performance Grip with No Sweat, No Smell and Lightweight easy to carry design. Keeps your hands dry and sweat free. Comes with Right and Left Hand combination. Comes as Pair and Brand New with One Size Fits All. We also Entertain Bulk Orders. Original Lifting Grips - by GRIP POWER PADS® The Alternative To Gym Workout Gloves Comfortable & Light Weight Grip Pad For Men & Women That Want To Eliminate Sweaty Hands While Exercising, Extra Thick Padding - Maintain Perfect Grip.